It's the kind of thing you used to see only in science fiction movies - but what you're looking at is real: software that captures every curve and shadow on your face - paired with cameras than can access that information in seconds - to identify who you are, and what you do. Joseph Rosenkrantz is the CEO of Face First, a California company at the forefront of facial recognition software development. ”When a person passes by a camera that's armed with this system, it actually converts the person into a biometric template," he said. The template is compared against a database of other collected faces to look for a probable match. Among the Face First customers: police departments, airports, casinos - and increasingly, the places you shop. And here's what they're looking for: shoplifters like the ones you see on this surveillance tape. Stores with facial recognition can ask suspects they apprehend to agree to have their photos taken, rather than be arrested, so they can be easily spotted and tracked the minute they come through the door. Retail theft prevention expert Joseph Larocca said, “It really does prevent or save retailers from losing merchandise, a problem last year that was over $44 billion in lost merchandise." But thieves aren't the only ones whose images are being captured. Face First also services stores wanting to "build a database of good customers, to recognize them when they come through the door" or to businesses that want to "get alerts when known litigious individuals enter." Georgetown University law professor, and privacy advocate, Alvaro Bedoya thinks the technology is being taken too far. “It used to be we knew when we were tracked online but when we stepped away from our computers, we weren't. Now we might be tracked whether we know it or not, and we can't stop it." One shopper we spoke with said, “not too happy about that, it's a little too 'Big Brother' to me." Another said, “It is fully an invasion of privacy." The latest research suggests that about three out of 10 stores now use facial recognition to track customer behavior. For more than a year, the U.S. Commerce Department held talks with business leaders and privacy advocates to develop a "code of conduct" for companies using the technology. In June, nine separate privacy groups walked out - saying the companies refused to accept the need for prior permission to face-print consumers. ”Keep in mind, you don't walk into a store alone. You walk in with your son, or with your daughter, so when all of this is being done in secret, not only do you not have a choice. Your family doesn't have a choice, and i think that's wrong," he said. 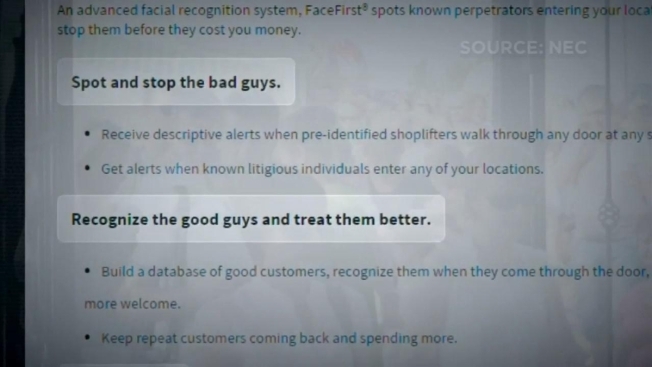 The Troubleshooters reached out to some major national retailers - to see if they'd confirm or deny using face recognition technology in their stores. Nordstrom, Bloomingdales and Neiman Marcus say they don't use it. Walmart confirmed it tested facial recognition out in several stores - but a spokesman said the chain ultimately pulled the plug - saying simply "It wasn't a good fit." Despite several attempts, there was no reply from Macy’s. Saks Fifth Avenue said "No comment."